HOST: Why drive when you can fly? Some California residents love their airplanes so much they choose to live with them in more than 30 secluded airpark communities throughout the state. JULIA SCOTT: Clint Bazzill’s lifelong dream came true last year when he bought a home in Cameron Airpark, California’s largest planned community for airplane enthusiasts, northeast of Sacramento. His backyard is a runway, and his homebuilt Kitfox is his favorite ride. The 75-year-old can taxi out, take a spin over Tahoe and have the plane back in the hangar before his wife, Janet, has made breakfast. “It’s kind of like driving a car, only instead of driving at 50 or 60 miles an hour you’re going at 100 or 110,” Bazzill’s says. In Cameron Airpark, planes and cars share streets as wide as highways. Street signs are toddler-sized so airplane wings won’t clip them. People here talk about their aircraft like others talk about their grandchildren. And the roar of engines overhead is music to their ears. “It’s to the point now where we can lay in bed, listen to the airplane and know whose plane it is and where they’re going,” says resident Bob Byrne. 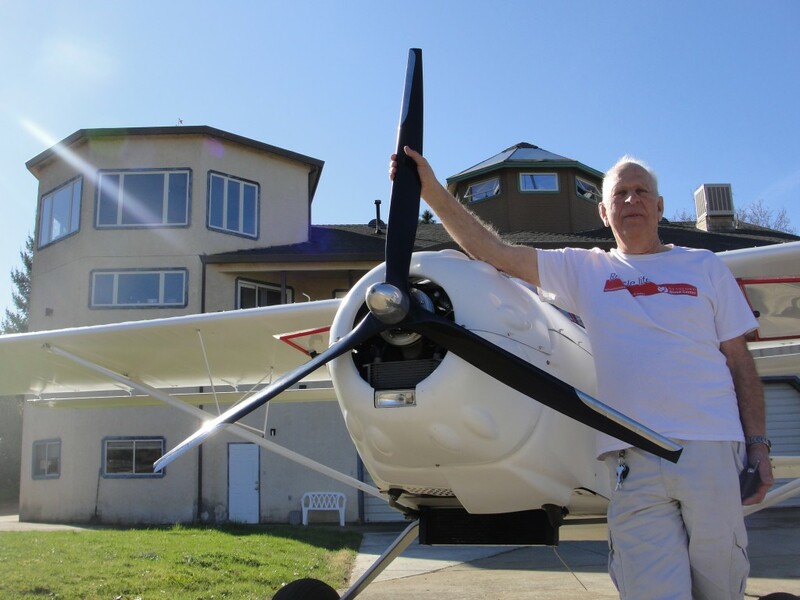 Byrne moved to Cameron Airpark 12 years ago and uses his Cessna four-seater to commute to Santa Cruz, where he works as a computer network engineer. It beats the 6-hour car trip, hands down. “It makes it as efficient for me as if I was living there. Unless there’s fog. Then I’m driving,” he says. Cameron Airpark dates back to 1961, the heyday of personal aviation. More than 600 airpark communities were built around that same time across the country, including the first one ever, in California’s Carmel Valley. These homes are an obscure slice of Americana. They belong to people who joke about the $100 burger, flying out of state for lunch and back. But public opposition has blocked new airparks in California for the last 30 years, using environmental regulations to push back against the noise and air pollution. To people who live here, the future of communities like Cameron Airpark is a source of concern. “The market overall is shrinking. The pilot population is aging,” says Dennis Nickson, a realtor who specializes in hangar homes. He lives in Cameron Airpark with his Nanchang CJ-6, a vintage military plane from China. The recession took a big bite out of home values here, where prices start at $300,000 but used to reach $1 million. A number of homes were foreclosed on. And fewer Americans are getting their pilots’ licenses today than any other time since the 80s. There are exceptions, though. Like 24-year-old Tori Hooper who is currently awaiting orders for officer training school for the Air Force to become a pilot. Hooper’s dad is a retired Air Force pilot. So is her grandfather. She and her brother grew up here without any kids their age to play with, so they played with airplanes. Now her and her dad are working an old war bird which she’ll inherit. Hooper says she’d love to raise a family of her own in Cameron Airpark someday. “People get each other and we’ll have cookouts and barbecues, and Octoberfests and Valentine’s Day this and Super Bowl that, all for the sake of maintaining a Cameron Park identity,” she says.